The next promotional giveaway event has begun. You can now get a free lvl 100 Darkrai in Pokemon ORAS and Pokemon XY. In order to recieve the Pokemon, go to your nearest GameStop (North America Only) and request a download code from the clerk. Enter the download code in your game and go pick up your gift from any Delivery Girl in a Pokemon Center. 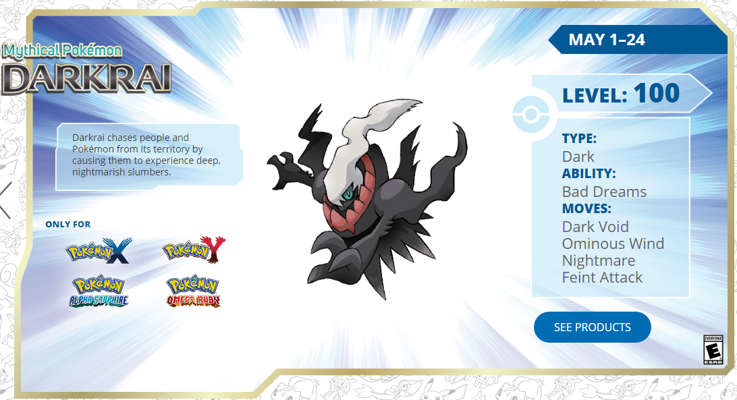 Darkrai includes the moves Dark Void, Ominous Wind, Nightmare, and Feint Attack. The Pokemon's type is Dark and the ability is Bad Dreams. This promotion runs from May 1, 2016 until May 24, 2016. Be sure to check back next month for the next giveaway for Pokemon's Anniversary!